After winning the first two games in the series, the Milwaukee Brewers dropped the last two, including Sunday’s 8-2 loss to the St. Louis Cardinals at Miller Park. The Cardinals scored five runs in the fourth inning as they sent Brewers starter Jhoulys Chacin to an early shower. Chacin (6-3) allowed all eight runs in 4 1/3 innings to take the loss. Prior to Sunday, Chacin and Junior Guerra had been the teams two most reliable starting pitchers. But Chacin started things off by walking leadoff man Matt Carpenter on four pitches and dealt with traffic on the bases in every inning he pitched. Chacin continued his struggles against St. Louis, falling to 0-7 with a 6.90 ERA in nine career appearances. He dropped to 0-2 with an 8.59 ERA in three starts against the Cardinals this season. The Brewers lead early (2-1) as Christian Yelich belted a solo home run to left-center field. But Lorenzo Cain and Jesus Aguilar were given the day off and third baseman Travis Shaw left in the third while still struggling with a sore right wrist. The Brewers scored 11 runs in the series opening win over the Cardinals last Thursday, but they’ve scored just two runs in the last three games, losing the last two. The Brewers have Monday off. They’ll open a two-game series against the Kansas City Royals on Tuesday night at Miller Park. Hitting just .249 with 3 home runs and 17 RBI, outfielder Domingo Santana was sent to the minors to try to get his swing back. 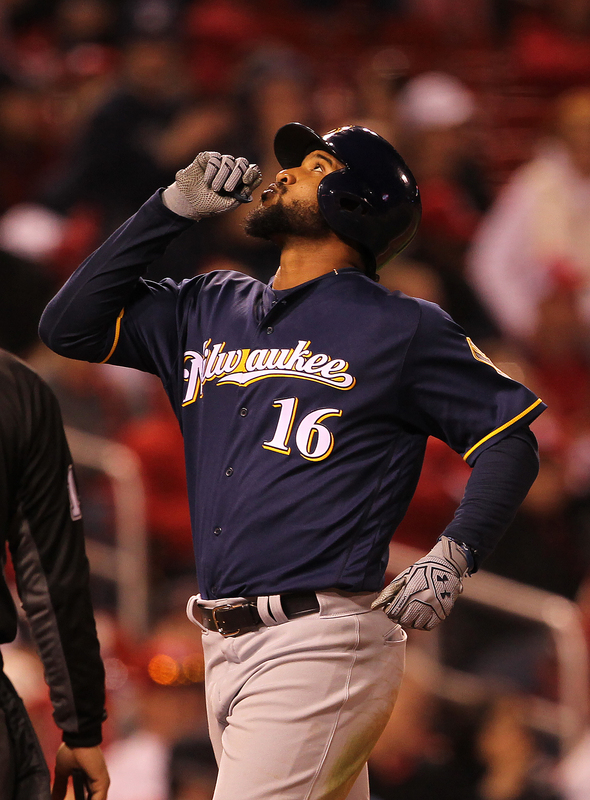 Santana was a big part of the Brewers offense last season, clubbing 30 home runs and driving in 85 runs in 151 games. But Santana hasn’t been in the lineup for two-plus series and the Brewers need to get his game back on track. To replace Santana on the roster, they recalled infielder Brad Miller from the minors. Miller played in eight games at Colorado Springs and was hitting .185 with one homer and two RBI.